A straightforward comparison between Britain remaining in the EU and leaving isn’t possible. That’s because we know what ‘Remain’ in the EU means – it’s the status quo and we’ve experienced it for four decades. Nobody knows; nobody can say for sure. 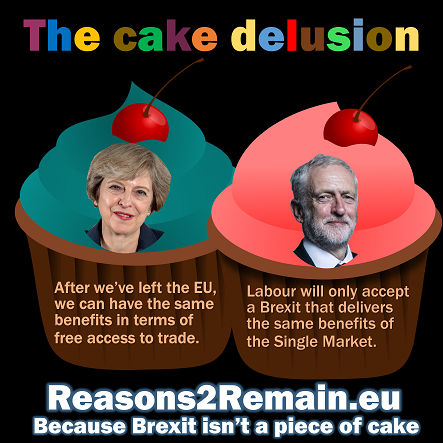 Even those campaigning for Britain to leave the European Union cannot agree with each other on their different visions of Brexit. And even if the ‘Leave’ campaigners could agree with each other, none of them can promise to deliver. 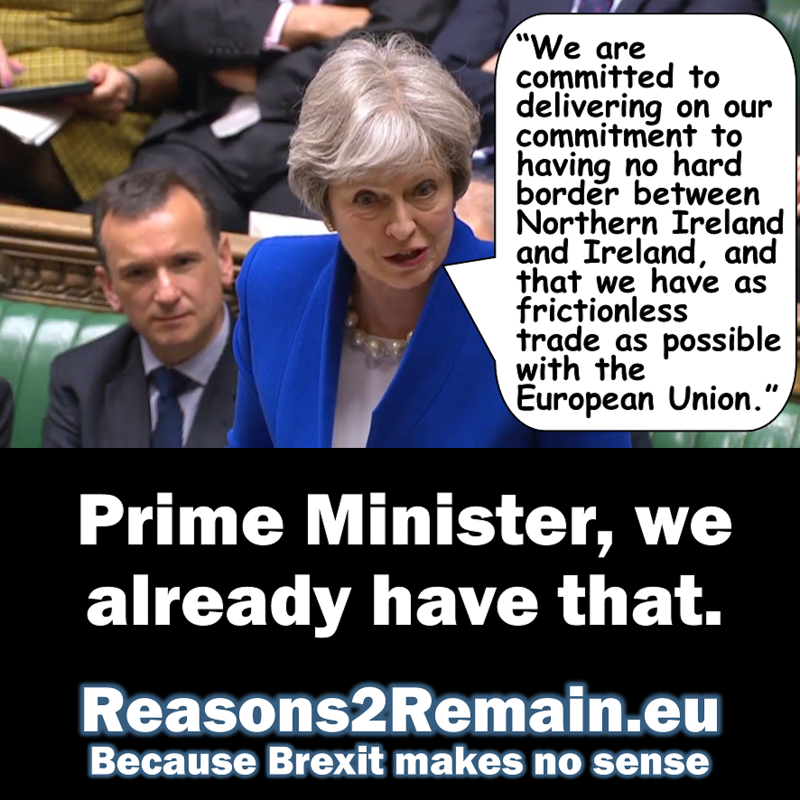 They are not in power, and even if they were in power, their (different) dreams of Brexit would require the agreement of over 50 countries, which would take years to negotiate, with no guarantee of the outcome. 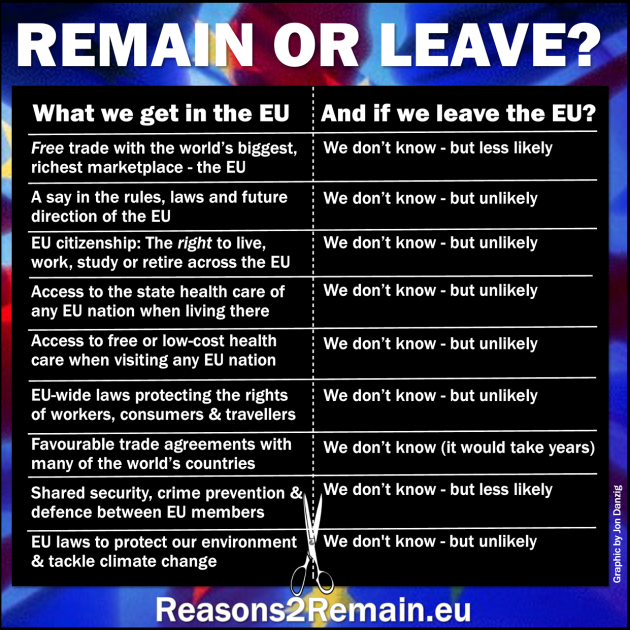 There are many lists showing the benefits of Britain remaining in the EU that are credible and evidence-based. That’s because we’ve been a member of the EU (previously called the EEC) for 43 years. We know what we get in the EU. We already have it. But any lists of the benefits of Brexit have to be entirely hypothetical. Nobody knows for sure. No member state has ever left the EU. The only honest answer is that there would be years of disruption and uncertainty before we discovered for sure what would be the advantages, if any, of Britain outside of the EU. Top of the list is that it’s only because of EU membership that Britain enjoys full free trading status with all the other member states – representing the world’s most lucrative market place, and by far our most important trading partner. As such, almost half of our exports go to the EU, and over half of our imports come from the EU. The EU has an iron tariff wall against non-members; so would we really want to be on the wrong side of that wall as an ex-member? Even non-European countries that have negotiated ‘free trade’ agreements with the EU don’t enjoy full free trade access to Europe’s internal market, as Britain does now. 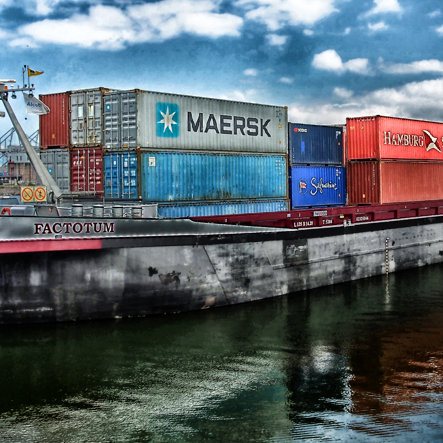 Could Britain continue to participate in full free trade if we left the EU? We don’t know for sure, but it’s less likely. Unless, like Norway, we were accepted as a member of EFTA/EEA. However, like Norway, we would still have to obey the rules of the EU single market (including free movement of people) and we would still have to pay an annual contribution to the EU. And like Norway, we would have no vote in those rules or the size of our annual contribution to the EU. Would there be any point to leave the EU for that? Next on the list is that as a leading member of the EU, we have a say – and votes – on the rules, laws and future direction of our continent, Europe. Would we have that as a non-EU member? No non-EU member has a say or vote in those rules, so it’s highly unlikely that an exception would be made for Britain. Otherwise, what would be the point of an exclusive club offering exclusive benefits for members? The right to live, work, study or retire across our continent is a precious membership benefit that around two million Britons already enjoy. Would that right continue if we left the EU? Nobody really knows, but it’s unlikely. The residence and other rights of Britons already living across the rest of Europe, and citizens from the rest of Europe already living in Britain, would be thrown into doubt and confusion if ‘Leave’ wins the referendum vote. When we live and work in any other EU county, we can enjoy many of the same rights as citizens of that country – such as access to the state healthcare of that country, and the same rights as workers of that country. It’s unlikely that could continue if we left the EU. 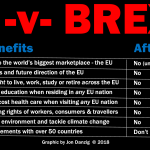 Similarly, free or low-cost healthcare when travelling on business or holiday across our continent is another cherished benefit of Britain’s EU membership – that would be unlikely to continue on Brexit. EU laws protecting the rights of workers, consumers and travellers across the continent are probably among the most important reasons for Britain to remain an EU member. For example, 4-weeks paid holiday a year; the 48 hour working week; anti-discrimination law; guaranteed rights for agency workers; guaranteed worker consultation – all of these protections largely exist because of the EU. Would we retain those rights if Britain left the EU? We don’t know, but it’s unlikely. If we took away the strong armour of EU employment law, workers’ rights would be at the mercy of a Conservative government. Anyone who believes they would then be in safe hands might be in for a rude shock upon Brexit. Consumer and traveller protection laws are also arguably much stronger as a result of EU laws than we would have enjoyed under national legislation alone. In any event, how can a national government assure safety and protection across a continent? The simple fact is that it can’t – it needs the reach of a pan-European intergovernmental organisation to achieve that (albeit with the democratic consensus of member states). For example, comprehensive passenger compensation when, say, an Icelandic volcano seriously disrupts air travel – such compensation is only possible because of EU law, not national law. Abolishing exorbitant mobile-roaming charges across Europe was also only possible because of EU law – no nation state alone could have achieved that. Europe-wide consumer protections, such as when buying products online or by phone, came about because of EU law rather than national law. 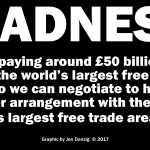 Because the EU is the world’s richest, biggest market-place, and the world’s biggest exporter and importer of manufactured goods and services, it can negotiate the best trade deals with other countries. It’s often said that when negotiating, you get better deals if you’re the same size or bigger than your opposite number. The EU is the biggest economy – bigger than the USA, bigger than China, bigger than Japan. It has the muscle to negotiate extremely favourable trading terms with the world’s countries. Could Britain, being considerably smaller and less important than the EU, achieve similarly good trade agreements with the world’s countries? It’s unlikely, but in any event, it would take many years to find out after we had left the EU. There are many collaborations that take place between scientists, doctors, lawyers, accountants, etc, between EU member states that are made much easier and more effective because we’re all in the same club. For example, we work with our EU allies to help to protect our environment in Europe and to tackle climate change – issues that no single nation alone could as effectively deal with. Could that continue on the same level if Britain left the EU? And of course, because of agreements and directives agreed between member states, there is considerable Europe-wide sharing of intelligence, information and practical collaboration in the fields of policing, security, defence and the prevention and combat of crime. “We check people at our borders, but what matters at our borders is that you have the information about people that enables you to make that decision about whether somebody should be allowed into the UK or not. Could that co-operation continue with our EU allies if Britain left the EU? Again, nobody knows – it might, but at this stage, nobody can guarantee that it would. Is the British electorate likely choose Brexit and all the uncertainties that option offers? Anything is possible. However, in all the referendums so far in Britain, the electorate has never voted against the status quo. What will be important is that everybody who can vote in the referendum does vote. That way, at least the decision about Britain’s future will be decisive. This entry was posted in Current Affairs, Democracy & Citizenship, Economics & Trade, Global & International, Law & Justice, Media & Communications, Politics & Public Policy, Security & Defence, The EU and tagged Bremain, brexit, European Referendum, European Union, free movement, free trade, President Obama. Bookmark the permalink.